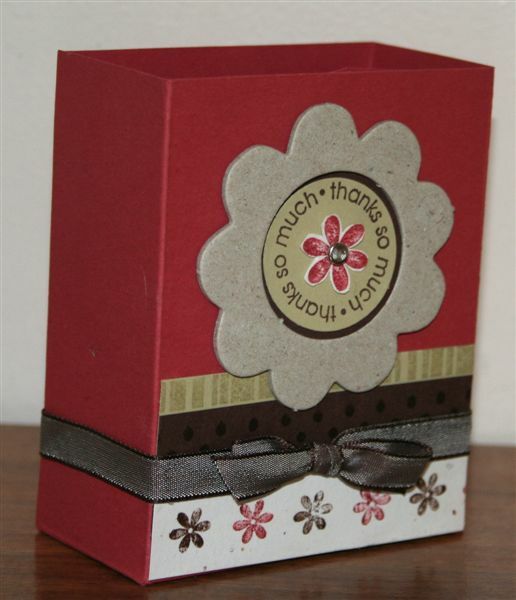 I just can't get enough of the new colours Stampin' Up! have introduced this year. Just when I think I have a favourite, I find another great combination. Loving the Purely Pomegranate though, that's for sure. How cool does it look with the new Basic Grey cardstock? I have used a combination of stamps here - Boho Backgrounds again (love love love these), Baroque Motifs and Life Definitions which is very cool set of stamped definitions. How great does the Scallop Punch work with the motif from the Boho Backgrounds stamps? I have had a lovely weekend. Some good friends got married last night and it was a really beautiful wedding and a fun reception (even though I do have bronchitis!). Today I got to create with some lovely happy and creative ladies in Wallan (waving Kim and friends) and tonight I am home with my family listening to the rain. The boys are secretly happy Mum has lost her voice I think. I have a quieter week ahead and I am away on a country retreat with some lovely friends next weekend, so lots of time to recover and create. Life is good. I hope yours is too. Our team meeting went off well yesterday. We had a fun day creating and chatting and swapping, pretty much continuously from 10 in the morning until after 11 at night. We have such a lovely group and it was a lot of fun. I got to finally play with some of my new stamps (and others that people bought along to share!). Here is one of my creations. 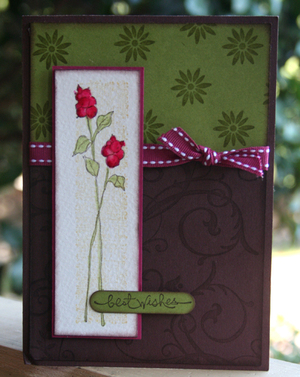 This card is made from the Oh So Lovely hostess set and was inspired by a gorgeous card Tracey made as a swap at convention. 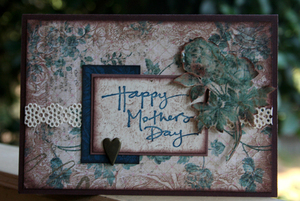 I have also used the Baroque Motifs set on the background and the Short & Sweet set as the greeting. The colours are Old Olive, Chocolate Chip and Purely Pomegranate. I love the new In-Colour Double Stitched Ribbon. My ribbon swaps include a pack of 6x2m of each of the 6 In-colours of the stitched ribbon. How these work is I take names and when I have filled 6 places (which doesn't take long) I contact you for payment, place the order and send the ribbon out at my expense. It costs just $17, so email me today for your 6 colours! Next up we have Boho Backgrounds - a cute little set with four backgrounds including a circle design and a greeting set for just $29.95. I really love it. 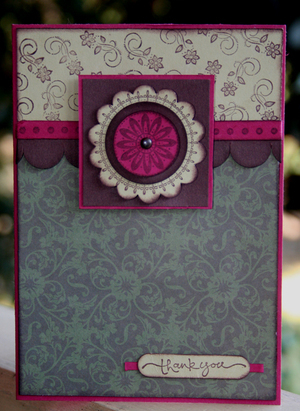 I have also used the Baroque Backgrounds Designer Series Paper, the Scallop Punch (yum!) and Short and Sweet again. These colours are River Rock, Purely Pomegranate and Chocolate Chip. 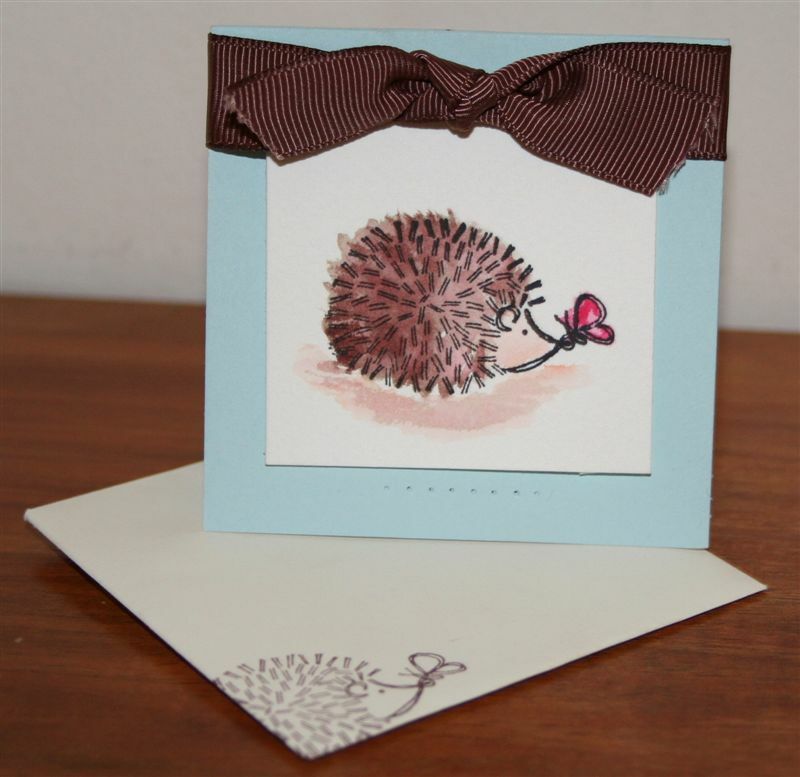 I also have another couple of creations (my favourite card from yesterday and a sort of matching scrapbook page which I will be sending out to my regular customers with dimensions and instructions to say thanks for being my customer. This is on my to-do list for the weekend. I have a card in 'The Artist and The Stamp' section of Australian Papercraft Magazine. I rarely get around to submitting these days, but I was sent this lovely Rachel Grieg greeting stamp and asked to make a card with it. I quite like how it turned out. Finally a thank you to everyone for their patience with me over the last two weeks post convention. It has been a crazy busy time with events, birthdays and just 'life' but I got through it and now I can get back to being around a bit more to answer emails! Have a lovely relaxing long weekend. I will be spending some time with Josh explaining more about the meaning on Anzac Day as he has been very interested and asking questions about the war.Lest we forget. Struggling to find time to post this week, have been so busy with many different things. Today was a happy day though as my Josh turned 6. We had a big party for him Sunday with school friends and relatives, and just a family day today. Have a team 'creating day' tomorrow - all day and night, so surely I must have things to post Thursday! I am soooooo excited to finally have time to just play with all my goodies! Jenny T, Marita, Kylie R, Natalie S, Emily W, Chris B.
Congratulations ladies. I can't tell you how much I love giving away freebies to my loyal customers! It's the long distance customers turn next! So great to be demonstrating and creating again! I had my customer launch party last night which was a great night. I enjoyed giving away over $300 worth of products to some loyal customers and they each got to do 3 make and takes as well. They made this card folder and also each of the two cards. I will be doing something very similar for my long distance customers next week so make sure you join my newsletters to hear all about it (sign up box top right). 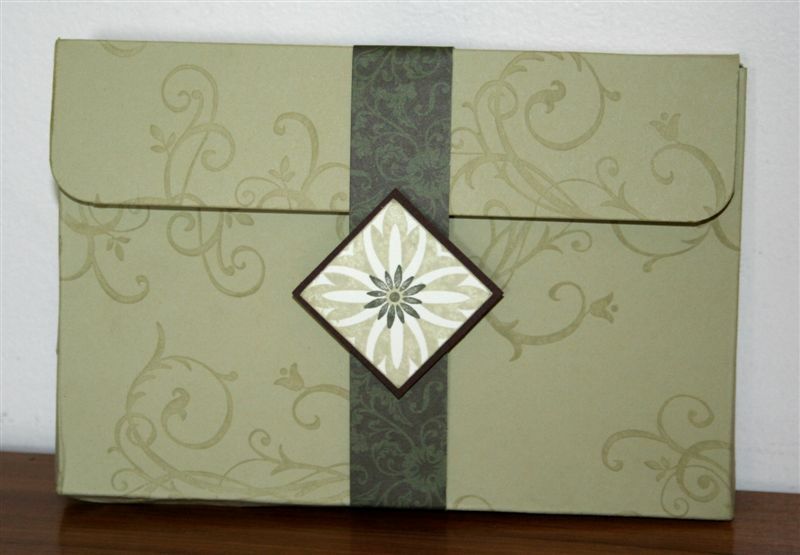 This set features the beautiful Baroque Motifs set and Brocade Background papers. The cardstock colour is the new In-colour River Rock (and the same colour ink was used. 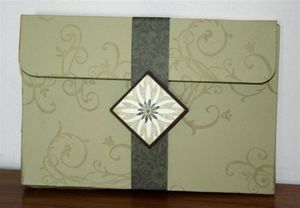 My customers will be receiving the pattern and instructions for this box next week. These cards feature the gorgeous new Scallop Punch and Think Happy Thoughts round greeting set. 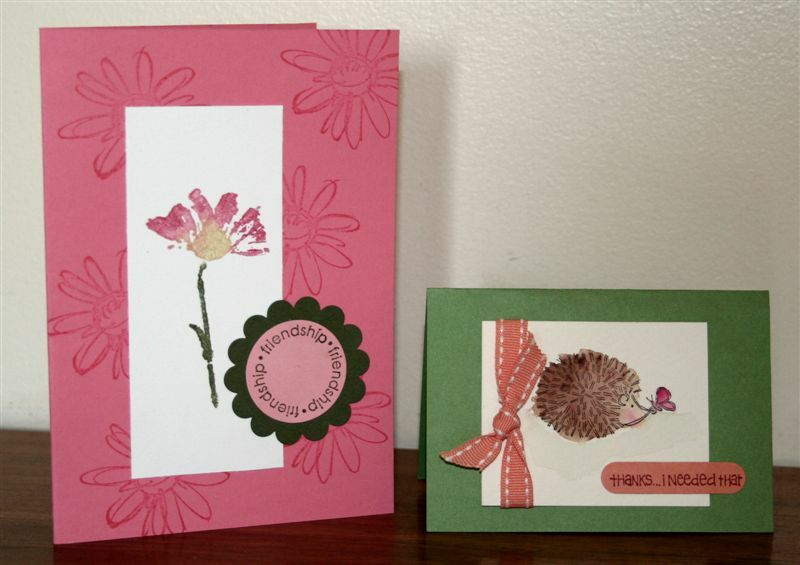 The card on the right uses two of the new In-colours, Groovy Guava (including the matching stitched ribbon!) and Wild Wasabi. The image is from Fun Fast Notes. I've also managed to photograph a couple of the make and takes we did at convention. 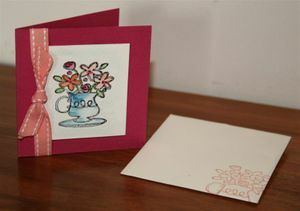 These cute cards and matching envelopes feature the envelopes from the Love Notes cards and envelopes set. I have used Fun and Fast Notes again (love the versatility of this set already!). We also made this little box using some of the new On Board Chipboard and the new Happiness Background. Back again soon with more pictures! Wow, that was an experience to be remembered. It was amazing. I feel so inspired, motivated and appreciated all rolled into one! We were so spoilt! I have so much to share with you over the coming days. 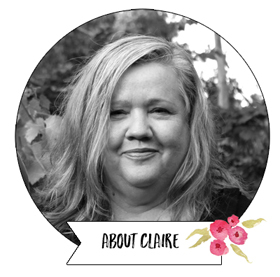 I met so many amazing people, and was really chuffed about all the people who came up to me and said they visit my blog regularly (waving to you now). 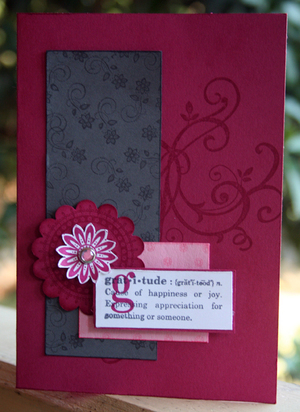 It really is the relationships that make Stampin' Up! so amazing. A highlight for me was definitely meeting the staff from America. Shellie Gardner (the founder and CEO) is such a gorgeous person. I was so excited to have my picture taken with her and got to walk across the stage and be congratulated by a hug from her 4 times! The other staff were also wonderful, including our very own Australian staff. I can say that scrapbooking is going to be HUGE in Stampin' Up! over the coming years. The products, the ideas and the value for scrapbookers is amazing in the new products. I am so excited about this as you all know I have a passion for scrapbooking! So if you are a scrapbooker and you are looking for a great way to earn some extra income, email me now as I am looking for more scrapbookers in my team right around Australia. I received a lovely surprise on the first day. 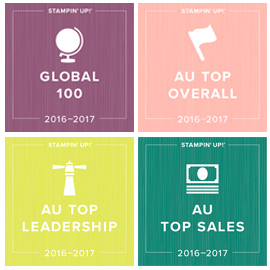 When I registered, I was given a special pin to say I was one of the top 25 Australian Stampin' Up! Demonstrators of the year (out of 1458 active demonstrators) - OMG! I was really surprised as my goal throughout the year had been to build my team, rather than focus on my own individual sales, and with the Demonstrator of the Year weighted towards sales, I hadn't given it another thought. It looks like the leadership and team goals I achieved though got me up there, so I am very very proud of my team and grateful to my lovely regular customers for their support! I got to go up on stage with the other girls and we received special certificates and roses as well. 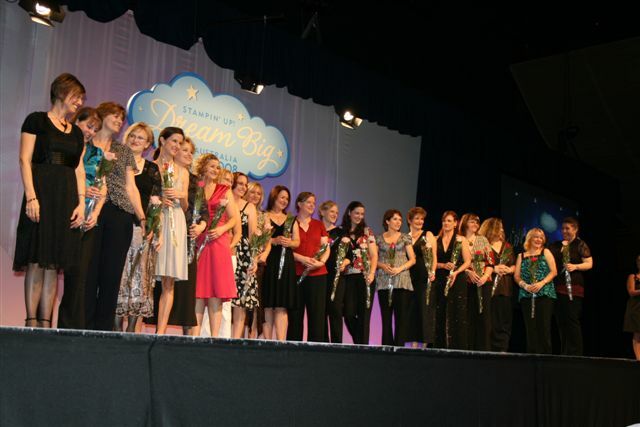 Here is a pic with me 3rd from right and the gorgeous Shelli Gardner far left. This one is of the certificates and roses we received on the night. 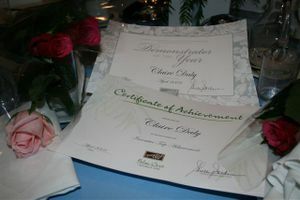 I also received a rose and certificate for earning the annual incentive trip to Palm Cove in August. There are 21 other Australian demonstrators going.